When everyone over 14 loses their minds and becomes diseased with a terrible infection – the kids must survive!! There are rumours that Buckingham Palace is safe but they must get there without getting injured by the grown-ups!!!!! Will they make it or will they die? It is book 1 in the enemy series !!! WARNING!!!! Contains swear words and extreme violence!!!!! 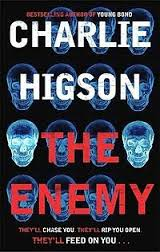 Thanks Awesome Guy, I just got a signed copy of The Enemy and hope to read it soon, without to many nightmares! !